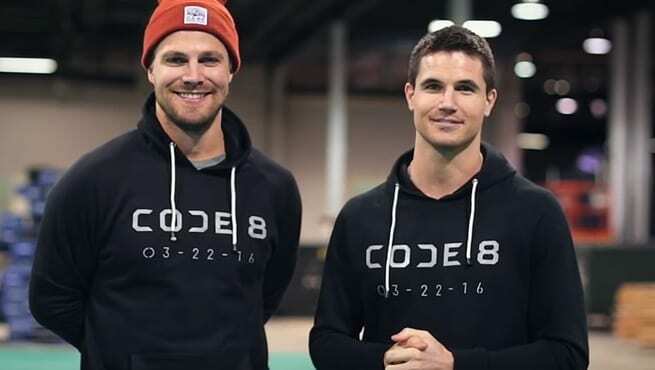 HomeFandomStephen and Robbie Amell Drop New Teaser Clip for ‘CODE 8 MOVIE’! For the past 8 years, Stephen Amell has been officially winning over our hearts since he first appeared on Arrow and he continues to do so in his off screen time. He is the kind of person who is absolutely passionate about everything he believes in – and one of his biggest passions, which we frequently see him posting about on social media, is his family. His family, in addition to the projects that he believes in. One Big project that he and his cousin Robbie Amell have been working on, is their upcoming Code 8 movie. Code 8 will be the very first feature film that they will be making together, and given how passionate they are about a delivering a thrilling story – we know that it is going to be a phenomenal story. Together, the pair and the rest of the Code 8 team raised over $2 Million dollars from over 27,000 backers on their crowd-funding site, Indiegogo. Having an original goal of $200,000 – the film has sky-rocketed all expectations and the Amell cousins look to not only deliver an incredible movie, but a new-age scifi film that we all have been anticipating for years. If you are looking to contribute to the film, be sure to check out the official Indiegogo Campaign Page for some incredible perks! Congratulations to both Stephen and Robbie Amell on this incredible accomplishment!